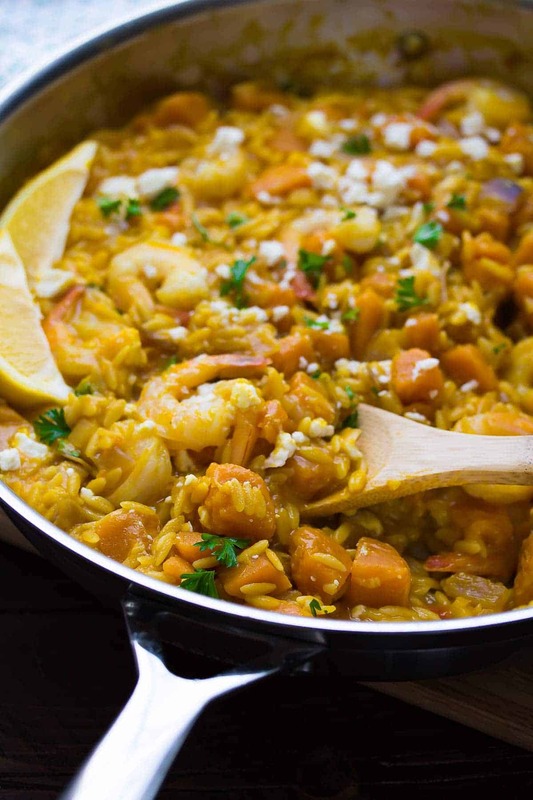 An easy and delicious one pot shrimp and squash orzo recipe. It gets such a creamy texture from the squash, and a boost of flavor from feta cheese. Do you ever just have those days where you don’t want to adult? Meaning you want to ignore all responsibilities and let your inner child out? Does this happen when you haven’t had enough fun? If so, I need more fun in my life and less chores (although my house tells me that I actually need to do more chores). Well anyway, this One Pot Shrimp and Squash Orzo means more time for fun in my life and less time washing dishes. So that’s a good start! This recipe was tested with three different types of squash! Because I’ve been loving butternut squash a little too much and I thought it would be good to branch out and see what else is out there. 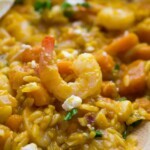 The first time I tested it with acorn squash, and the flavors were really great with the shrimp, feta, and creamy orzo. The second time I tested it with kabocha squash, which is what is pictured here. I didn’t actually like this squash in the pasta. 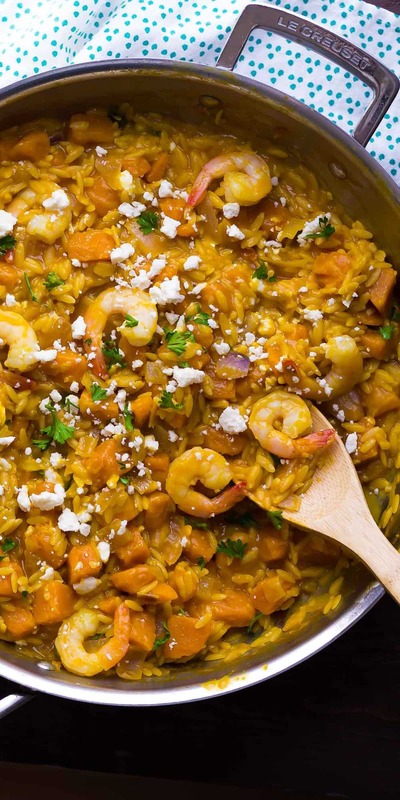 It was actually a bit dry, and the kabocha squash had a much stronger flavor that overpowered the shrimp, feta and orzo. So. Round three. Mom to the rescue! My mom (HI MOM!) tested this recipe with butternut squash for me (so that Ben didn’t have to eat this for the 3rd time in a week), and says it was excellent. So here are my recommendations: acorn squash or butternut squash. 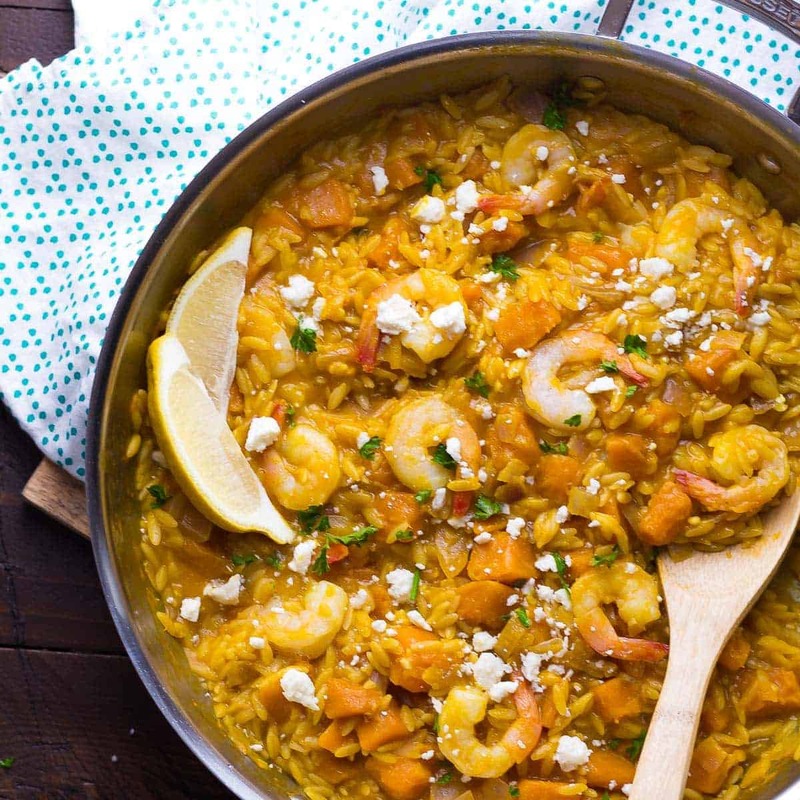 They won’t make a pasta that looks quite as orange as this one, but the flavors will be much better with the shrimp, feta and orzo. 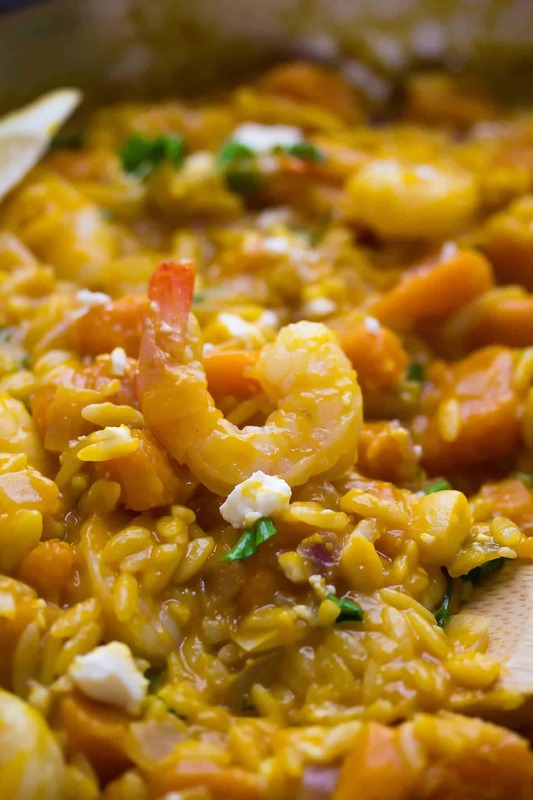 This shrimp and squash orzo is SO creamy, thanks to the starch from the pasta and also from the squash….you’d think there is a bunch of cream or cheese in there, but nope! Pure healthy comfort food here! The feta cheese and a squeeze of lemon before serving brings a bit of brightness to the dish, and a splash of sherry in the cooking liquid gives it some depth. This is definitely one of my favorite one-pot pasta recipes on the blog. Try it! Then come make some snow angels with me. No more adulting for us! Heat olive oil over medium heat in a large (12-inch) pan with a cover. Add the squash and onion to the pan, and cook uncovered, stirring occasionally for 5 minutes. Add ½ cup water to the pan and cover. Cook for another 5 minutes until a fork goes into squash easily. There should be no water left at this point. Add the garlic to the pan and cook for 30 seconds-1 minute, until fragrant. Add the sherry to the pan and scrape up all brown bits from the pan. Add the chicken stock, salt and orzo. Cover and cook, stirring every couple of minutes, until orzo is al dente, roughly 10-12 minutes. If pasta seems to be getting dry, add additional liquid as needed (Up to 1 extra cup chicken stock). Stir in the shrimp, cover and cook for 5 more minutes, or until shrimp are cooked through. You will want to stir it every minute or so to prevent the orzo from sticking to the pan. Sprinkle with feta and parsley and serve with lemon wedges. I recommend using acorn squash or butternut squash in this recipe. I do not recommend kabocha squash. Wow, this was so tasty and easy! I used barley instead of orzo, which took about 45 minutes to cook. The creamy squash with the wine and shrimp felt very decadent. It made a very generous amount. Glad it worked with barley! Thanks for reporting back! I would like to know you say the recipe is for 4 servings and then at the end the nutrition information says serving 1 of 6 ? So are the info for the exact recipe but separate in 6 serving instead of 4. 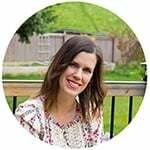 Sorry for my english I am french but love all your recipe. Thanks ! You are right, that’s confusing! The recipe serves 4-6. I’ve updated it, sorry for the confusion! How do you think this would be with rice instead of orzo? Hi Meg, sorry for my late reply! I honestly can’t say, I’ve only tested it as written. If you did try it, you’d likely need to increase the liquids and cook for longer. I hope that helps! Could I use something instead of orzo? My little boy is gluten-free. This looks so yummy! Hi Hannah, sorry for the delay (I’ve been travelling). Unfortunately I have no experience working with gluten-free pasta, so I can’t say for sure how it would work with it. I wish I could be more helpful. looks delicious! I need to start introducing shrimp to more of my recipes. Just added some to a potato soup tonight with good results. Ha ha YES!! I didn’t know how good I had it as a child 😉 THanks, Ashley! Oh one pot meals are my favorite! Love the shrimp and squash combo. Sounds like a perfect dinner! Thanks so much, Gayle! Shrimp + squash is such a good combo! Yes, yes, YES to one-pot all the things and squash! Oh, and carbs because ALWAYS! 😉 I seriously need this comfort food in my face asap! I LOOOVE healthy comfort food! And even better if it’s made in one pot, because our home is telling me to adult it a bit more often, too… Whoops! I’m so looking forward to January, when I can… Well… Do more chores I guess? Haha! I really, really love this recipe, Denise! It’s going on our dinner plan some time soon! Yes My house is telling me that I need to get up and CLEAN. LOL. You always make the best one pot recipes, Denise! How sweet of your mom to test the recipe for you too, I totally wish my mom would do that ;). I love squash this time of year, so this sounds perfect! Thank you so much, Danielle! I was so grateful that my mom could test the recipe for me because we ate this for lunch and dinner for I think 4 days in one week…there is such a thing as too much of a good thing, ha ha!